Cuddle up with your favorite book and a 'Striped' cushion on your sofa or chair by LJ Home Fashions. Linen beige and barnyard red stripe print. Design is same on both sides of the cushion. Home decor fabric has a denim like feel. 100% polyester. One (1) 12x20-inch rectangular shaped cushion. 100% polyester hypoallergenic fill. Knife edge construction. Spot clean. Please note due to shipping, product will arrive in a slightly compressed state. Cushions will expand to final size listed in description. Transform the look in a room with this chic square accent pillow in a modern geometric design. The bold criss-cross stripes in light grey and white add a contemporary flair to your favorite chair, sofa, bed, or entryway bench.The woven design on both sides is on a soft polyester fabric, and the convenient side zipper allows for easy removal of the poly fill insert to machine wash the pillow cover. This versatile throw pillow will instantly give a vibrant boost to your dicor! Transform the look in a room with this set of 2 chic square accent pillows in a modern geometric design. The bold criss-cross stripes in red and white add a contemporary flair to your favorite chair, sofa, bed, or entryway bench. The woven design on both sides is on a soft polyester fabric and the convenient side zipper allows for easy removal of the poly fill inserts to machine wash the pillow covers. These versatile throw pillows will instantly give a vibrant boost to your dicor! Ortho Bed Wedge Pillow If you suffer from back pain, knee pain, varicose veins, phlebitis or restless legs, this cushion could help you achieve a more comfortable night's rest. Keeping your legs elevated at night can help to take pressure off your lower back, legs and knees. This supportive foam pillow will help elevate your legs at the proper angle so you won't have to resort to using pillows not designed for this purpose. Set the cushion at the foot of the bed and rest your legs on it. 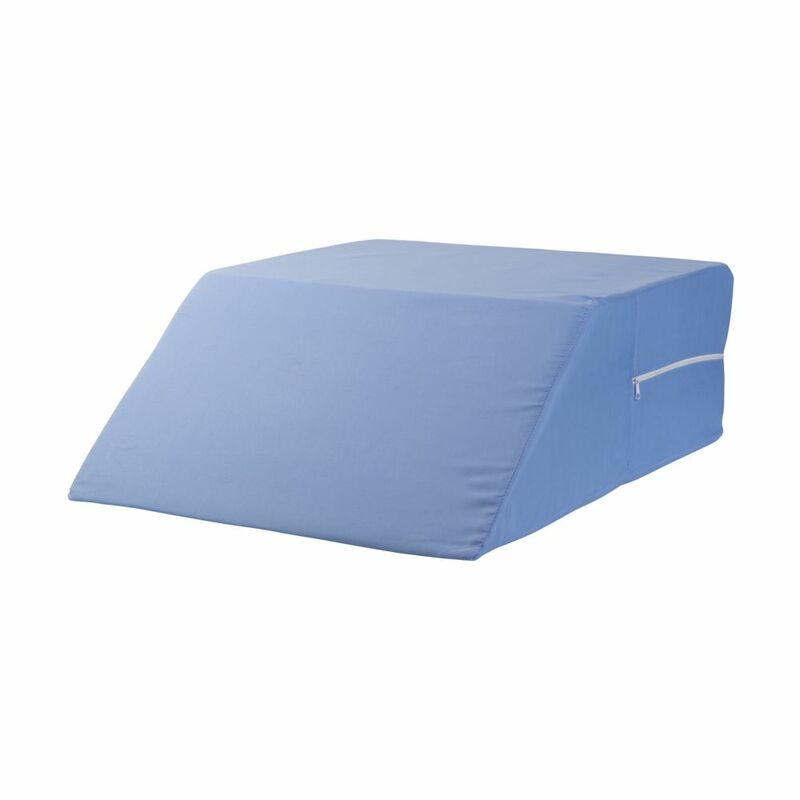 The bed wedge includes a removable blue poly/cotton which is machine washable. Ortho Bed Wedge Pillow is rated 4.0 out of 5 by 3. Rated 5 out of 5 by Martin from Very firm. Works great. Very firm. Works great. Rated 5 out of 5 by Lillie from Ergonomic design doesn't cut off circulation Fits almost all sizes. Very tall may need to place a couple pillow behind the end so ankles & feet are supported. Gives lower back the rest it needs by keeping legs in the correct position that other wedges do not. Obviously limited to lying on back so if this is not a possibility, do not purchase. Sure beats lying on floor and putting legs up on chair or couch seats. Would love to take a photo of me using pillow, but not possible while lying down. Worth every cent - even though it was purchased for me.